Samsung Galaxy S7, S7 Plus, S7 Edge and S7 Edge Plus all coming soon? Earlier this week, we've seen what could be the designs of Samsung's upcoming Galaxy S7 and Galaxy S7 Plus, which are expected to be announced in the first quarter of next year (likely in February at MWC 2016). Apparently, the regular S7 should feature a 5.1-inch display, while the S7 Plus might have a display of around 6 inches, though none of them seem to have curved screens. But this doesn't necessarily mean that Samsung is giving up on the dual-curve designs that make the S6 edge and S6 edge+ unique. A tweet from @evleaks (known for usually providing reliable information) reveals that Samsung might be working on four Galaxy S7 variants. Besides the Galaxy S7 and Galaxy S7 Plus, the company could also release a Galaxy S7 Edge and a Galaxy S7 Edge Plus. There's no word on the features of the S7 Edge and S7 Edge Plus, but we can certainly assume that they're just dual-curve screen variants of the S7 and S7 Plus. We must keep in mind that @evleaks doesn't say that all these Galaxy S7 handsets will undoubtedly be released. But it looks like they're mentioned in a list of devices somewhere. And we wouldn't really be surprised to see the S7 series including four different models (plus an eventual Galaxy S7 Active). What about you? Do you think it would be a good idea for Samsung to launch a 5.1-inch S7 and S7 Edge duo, plus a 6-inch S7 Plus and S7 Edge Plus duo? Woohooo ! But ... LG G5 is coming with a 1/2" sensor ! Fight ! As much as I would love to see all these devices...IMHO this isn't a good strategy to work with. Too many devices and even if the sales are high...cost of prodcution varies for all these devices and so overall profit margins would be lower in this scenario compared to if they were launching just one or at max two flagships. The counterpoint to your argument is that more choice is likely to have broader appeal, translating to more sales and hence more profit. There are people who expressly don't want a small (anything below 5.5") phone, and others who expressly don't want a large (anything above 5.1" or even 4.7") phone. Conversely, there are people who expressly do want a large (5.5" or even 6") phone, and others who expressly want a small (4"-4.7") phone. The more choice you offer, the wider the pool of customers you are likely to appeal to. Even Apple has finally conceded that one size does not fit all, leading them to a 2 size (4.7" and 5.5") lineup which, if the rumours are true, will soon be expanding to a 3 size (4", 4.7" and 5.5") lineup. G5 will have to bring it this year. No room for cheap design and down graded cpu. The leather backs won't cut it. Keep the sd card though. That was a smart move. I love the leather back, cause that's real "premium." i love LG G4 design. durable and yet still feel premium. No, it's Samsung Galaxy S7 Edge Plus Prime Duos Value Edition Neo! Where's Active & Active Plus??? You know, The S Series' rugged brethren??? I would love a Galaxy Zoom 7 with 1" sensor ! Q: Do you think it would be a good idea for Samsung to launch a 5.1-inch S7 and S7 Edge duo, plus a 6-inch S7 Plus and S7 Edge Plus duo? A: Would it be a good idea is what you're asking? Okay, First, Where you could tuck these 'BEHEMOTHS' cause no pocket known to mankind is capable of holding something with a 6" width (Likely more due to the bezels etc)... Second, most of us mortals don't have hands big enough to wield such an enormous phone as a "Daily Driver"...!!! Third, it's just AWFULLY HUGE!!! That pocket argument is what they used to say about anything above 4". FYI, there are people who walk around with 7" tablets in their pockets, and even some who do the same with 8" tablets. Yes, they may not fit in every pocket, but the idea that 6" is too big to fit in any pocket is very uninformed. so now the only difference is a large protruding camera on the rear and ear piece placement top middle. other than than copying apple from top to bottom, even stole the speaker design, antennae lines and rocker panel buttons. 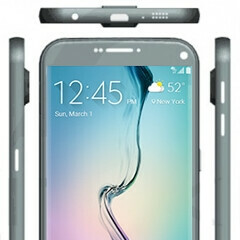 come on samsung, come up with your own design, geeeeezzzzzz! and stop biting off of Apple! I think the leak you might be referring to is actually fake. If you said that...then apple copied samsung for putting a screen on a phone. Apple TV copied other brands....list can go on. Geeeeeeeezzzzzzzzz stop living under a apple. Looking forward to the announcement Samsung! S7 edge plus will be mine in February!